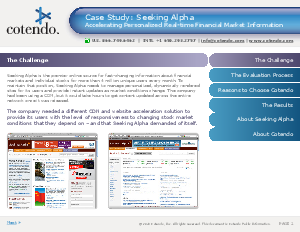 Seeking Alpha is the premier online source for fast-changing information about financial markets and individual stocks for more than 4 million unique users every month. To maintain that position, Seeking Alpha needs to manage personalized, dynamically rendered sites for its users and provide instant updates as market conditions change. The company had been using a CDN, but it could take hours to get content updated across the entire network once it was released.